Students in a new class on feminism learned about leaders in the struggle for women’s rights, such as social activist Gloria Steinem who fought for decades for women's reproductive rights. For many, feminism just took a flying, sword-wielding leap with “Wonder Woman,” the new film in which Amazonian warrior-princess Diana of Themyscira serves as protector of the free world. The Patty Jenkins-directed movie, the first superhero feature with a woman in the leading role, grossed $223 million worldwide in its opening weekend, the third-biggest launch for a DC Comics movie. 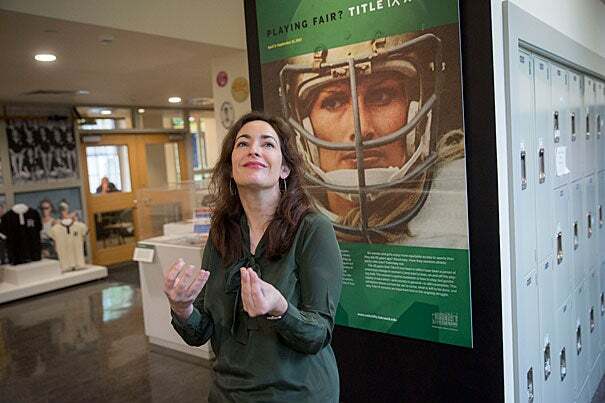 Though an important milestone for some, others consider the film just one more step on the long, complicated road to gender equality, a road Harvard cultural historian Phyllis Thompson and her class of undergraduates explored during the spring term. Thompson’s class “The History of Feminism: Narratives of Gender, Race and Rights,” a new Harvard offering that examined the evolution of major feminist narratives, aimed to replace the notion of a steady stream of progress with a more nuanced appreciation of the many actors, seen and unseen, responsible for advancing women’s rights over time. To help students dig into history and develop a more “honest appreciation for the past,” Thompson structured her course around four themes: the fight for political and economic citizenship; the regulation of family and domestic life; the struggle for the freedom of sexual expression and reproduction and identity politics; and the significance of utopian visions, idealism, and manifestos. “My thinking was that each time the students would go through the history from a different approach they would be forced to wrestle with what they knew, what they didn’t know, what the real genealogy is for any particular person or action,” said Thompson. There are other online timelines that chart feminism, but most begin sometime around 1700 and mainly support the idea of three important “waves.” The first, from the 19th century to the early 20th, stressed the vote, while the second, from the 1960s to the ’80s, emphasized equality in the workplace and in other areas of society. The third is ongoing, with a focus on cultural diversity. But defining the movement in such a strict chronological sense ignores critical voices, Thompson said. To address another imbalance, Thompson had her students contribute feminist-related entries to the largely male-oriented online encyclopedia Wikipedia. “Around 90 percent of the Wiki authors are male, so there’s been a real short-shrifting of topics pertaining to women and to feminism,” said Thompson, whose students crafted submissions on topics ranging from the Project on the Status of the Education of Women to Vilma Rose Hunt, a scientist and Radcliffe College graduate who helped establish links between smoking and lung cancer. Nora O’Neill ’18, a history of science concentrator with a secondary in women and gender studies, worked on a submission about the Junior League of Boston, a service-devoted women’s volunteer group founded in 1906. O’Neill said the course not only helped her understand how much of “history is political,” it also offered her a concrete way to make a difference. Students also wrote about 70 entries for the Online Biographical Dictionary of the Woman Suffrage Movement in the United States, an archive compiling biographical sketches of female supporters of suffrage campaigns in the first two decades of the 20th century. For much of their research, students needed only to take a quick walk across campus. Librarians at the Arthur and Elizabeth Schlesinger Library on the History of Women in America at the Radcliffe Institute for Advanced Study provided key support. Thompson said about 20 percent of the timeline’s entries came from Schlesinger material. In addition to encouraging students to “be makers of public history — to make feminism” through research and writing, Thompson urged them to make the future. For final projects, students crafted their own visions for a more equitable world in the form of a manifesto, a work of art, or a film. A Houghton Library exhibit contains ephemera related to poet and scholar Henry David Thoreau, such as this annotated 1854 copy of "Walden, or Life in the Woods," owned by a friend of Thoreau.